English: "The White Elephant Flag" Thai national flag from 1855 to 1916, 31 December. 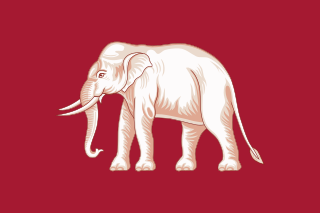 It has a white elephant (based on Image:Naval Ensign of Thailand.svg) on red plain rectangular flag. العربية: علم تايلاند (1855-1916)، وتتوسط العلم الفيل الأبيض. ปัจจุบัน 09:40, 28 กรกฎาคม 2561 900 × 600 (98 กิโลไบต์) Paul 012 The 2017 standard colours were based on historical specimens, and probably best represent the historical colours. 01:13, 10 กันยายน 2550 9,000 × 6,000 (40 กิโลไบต์) Xiengyod~commonswiki Edit red color and made more centralized the white elephant.